Harriers travel to Northwich tomorrow evening for game that should originally have been played last Tuesday but was called off due the Cheshire FA deeming the County Cup as a more important game than a League game. Altrincham also found their game called off for the same reason. On paper this is a game that we should get all three points from but as with these struggling teams sooner or later they realise that they need to start getting results or go under. In fact that's just what Northwich may be doing in the very near future with talk of going into administration yet again looming large. You have to fearful for these sides that are owned and run by a megalomaniac like Mike Connett. I'm not particularly au fâit with all the goings on at the Victoria Stadium but it seems that different parts of the club are owned by different companies but all pointing back to Mr Connett in one way or another. It means that if the actual club do go under then reform then they will have to pay rent to their former owner. The only option for the fans will be to do a Telford and re-emerge as AFC Northwich in a League at the bottom of the pyramid. We have to thank that we are not in a similar situation although there are parts of KHFC that are owned by another company with the same directors as KHFC. Back to the game in hand and after that fine win at Salisbury we'll be looking to get back towards the top of the table by winning this game. It'll have to be done without Scott Bevan again but on Saturday Chris MacKenzie was an admirable stand in for the number one. MacKenzie was so good he must be the main contender for this weeks MotM award on the website. Sir Jeffery Kenna didn't play at Salisbury and Simon Russell wasn't even on the bench so it must be assumed that they may miss this game too. James Constable picked up a knock down there but I'm pretty sure he'll be ready for the Vics. Northwich have a few players out injured. Lee Steele (hamstring), Michael Welch (collarbone), Jake Speight (knee) and Johnny Allan (broken leg) will all miss the game. They sacked manager Neil Redfearn recently - although it seems he still remains with them as a player - and Paul Warhurst came in as manager but for just one week before walking out on them citing differences between himself and the owners. Dino Maamria stepped up to the gallows as their next manager to inherit a squad that includes five on the transfer list. Greg Strong, Kevin Townson, Michael Byrne, Brad Maylett and Simon Rusk have all been told they are open to offers and can leave whenever. The Vics now include a former Harrier in the side. Simon Heslop is now at the club for a month following a loan from Barnsley. 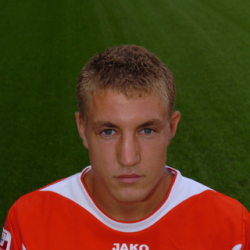 He is still yet to make his debut for Barnsley some two years after leaving us and it looks like he never will. Although I said at the top that we couldn't expect Northwich to not go down without a fight I still think we'll be far too strong for them and if Woking can beat then, as they did on Saturday, then I see no reason why we can't do likewise. Coleman, MacKenzie, Harkness, Kenna, Bignot, Creighton, Whitehead, Munday, McGrath, Ferrell, Bennett, Hurren, Russell, Penn, Richards, Blackwood, Barnes-Homer, Smikle, Christie, Constable. Connett, Murphy, Furlong, Hardy, Sharp, Strong, Birch, Byrne, Carr, Williams, Brown, Battersby, Townson, Maylett, Maamria, Tait, Redfearn, Johnson, Wilson, Coulson, Scales, Heslop, Evans.